– Gently muddle the ¼ red bell-pepper and raspberries together into the mixing glass. – Add barspoon of agave syrup to dissolve with lemon juice then fill up with the remain ingredients. – Add ice and shake it! – Strain into a rocks glass filled with crushed ice. – Floating the mescal on top and garnish with lemon zest, stick of berries and sprig of mints; then sprinkle pinch of black pepper. 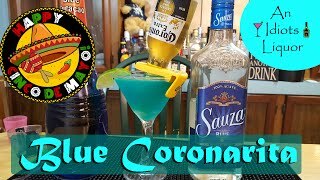 Blue Coronarita - Try this drink recipe for Cinco de Mayo. - Margarita and a Corona.